If you had told most Cardinal fans Friday morning that this club, this inconsistent, maddening club, would have swept the Pirates this weekend and finally reached the 10-games-over plateau, I think most would have expect that the Cardinals would have at least been playing on Monday in the tiebreaker game, if not nabbing the second wild card altogether. Instead, the Giants were terrible hosts to the Dodgers during Vin Scully’s last weekend and used their own brooms, sending the Cards home early for the first time since 2010. Before we get into the final recaps of the 2016 season, we should note how the stage was set. On Friday afternoon, the news came out that the Cardinals were not going to pick up Matt Holliday‘s option for next season and, while there was still a chance the two sides would work out a deal, those chances were pretty low. As such, Holliday requested to be activated from the disabled list so he could have one last moment with the St. Louis fans that he’s connected with over his seven and a half years wearing the birds on the bat. He wanted one moment. He got three. Hero: Carlos Martinez. The Cardinals were playing must-win baseball this weekend and Martinez made sure that if the win didn’t come, it wasn’t his fault. Martinez threw seven scoreless innings, striking out nine and allowing just five hits. Martinez was off limits on Sunday, according to Mike Matheny, because of the load that he’d taken on this year. If his last start was any indication, he shouldered that workload just fine. Goat: Randal Grichuk. The end of the season wasn’t kind to Grichuk, who hit .184 over his last 10 games. Here, he went 0-4 and struck out twice, leaving two on. Thankfully, it didn’t make a lot of difference in the final score. Holliday, wiping away tears due to the overwhelming ovation that he had and thinking that this likely is the last time he bats for the Cardinals, has his first pinch-hit home run of his career. (Given that Holliday has played since 2004, I would have expected him to have more than 45 plate appearances as a pinch-hitter coming into this weekend. I guess that’s what being a durable starter gets you!) 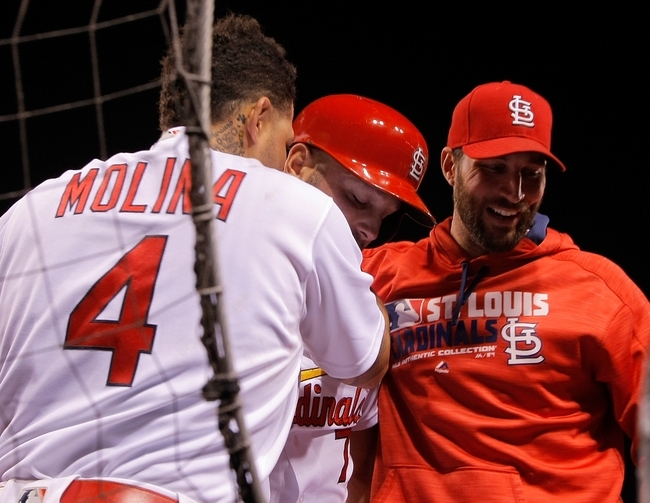 It was an incredible moment, made more so by the scene at the plate, when Yadier Molina and Adam Wainwright, the current triumvirate of the “aging core”, met him as he rounded the bases. While the Cardinals have been battling for the wild card, it’s been fairly easy to overlook that this really is a team in transition. Molina had a great second half, but he’s a 34-year-old catcher. Wainwright, man, that’s going to be a hot topic for this offseason. Is he the pitcher we saw most of the year, giving up runs like they were candy? Can he regain at least some semblance of the top starter he used to be? The answer to that sort of question is going to be pretty key for John Mozeliak this winter. So to have one more moment with these three, three that have meant so much to St. Louis, was very special. Of course, one of the only reasons Holliday got to pinch-hit was because the offense had already shown up, putting five on the board before Holliday batted in the seventh. Molina doubled in and then scored a run, plus brought the final run in with a double play ball. Brandon Moss had a temporary reprieve from his troubles, going deep in the four-run sixth. Jedd Gyorko started it all off with a home run. Every starter besides Grichuk had a hit or a walk and all but Grichuk and Peralta scored a run. It was a balanced attack that led to a dominating victory. Hero: Jedd Gyorko. The Cardinals got down early, then rallied to tie the game. Heading into the eighth, the decision was still in doubt. A win was vital. So Gyorko, perhaps the best move of the offseason for Mozeliak, took care of business, battling Felipe Rivero for eight pitches before turning around a 100 mph fastball and lining it into the right field stands. That gave Gyorko 30 home runs on the season, which was incredible for a guy most expected to be a backup, well-used but still a backup, when he was acquired for Jon Jay. Goat: Michael Wacha. The bullpen turned in an incredible outing and we’ll talk more about that in a bit, but Wacha obviously didn’t have it. He alternated base runners and outs, which you can do as long as one of those base runners doesn’t trot around the bases entirely. Jung Ho Kang, who is a worthy heir to Aramis Ramirez as the Pirate Most Likely To Be A Sith Lord, crushed a three-run home run and for much of the day that looked like it was going to end the Cardinal season. Wacha threw 29 pitches in the frame and Matheny removed him after the first, deciding to piece together something rather than risk him returning to the field. There were a lot of gripes before and during the game about Wacha starting. Some advocated using Trevor Rosenthal, which gained a lot of merit when Rosenthal went three scoreless innings in this one. The game isn’t won if Rosenthal doesn’t do what he did, I don’t think, and it was an incredible outing. That said, I don’t think Matheny thought Rosenthal could go more than two innings, but he felt Wacha might. (Granted, the odds weren’t in his favor on that, given that Wacha’s struggled after two frames as well.) It’s tough to make the case that Rosenthal, who actually had looked better of late, wasn’t the better choice in a game that even at its best was basically going to be a bullpen game. Besides, Rosie’s always wanted to be a starter. If he doesn’t come back to St. Louis, at least he’d have that moment. There are going to be a lot of questions about Wacha this offseason as well. Will enough rest allow him to at least have some sort of good 2017, even if it’s just the first half? Can he start effectively again? Does he have to start? Where does he fit in on a team that has a pretty solid rotation coming back even without him? Lots to think about. Notes: Holliday got a chance to pinch-hit again here, even after stating to the media after Friday’s game that he’d have liked that to be his last trip to the plate. Thankfully, he came through again, driving in the second run of the three-run sixth with a flared base hit and putting runners on the corners so Matt Carpenter could drive the tying run in with a sacrifice fly. Credit also to Molina and Aledmys Diaz, who had two hits each, and the bullpen, which was outstanding. We talked a lot this year about the bullpen being the strength of the team. It didn’t always pan out that way, and there were times where we got nervous when anyone but Seung-hwan Oh took to the mound, but all in all it really was. In this one, six different pitchers threw eight scoreless innings, allowing a combined total of five hits, one walk, and striking out 12. In fact, Oh was the only one to really make things nerve-wracking, allowing two hits in his save chance before locking the door. Rosenthal bore the brunt of things, going three innings as noted, but kudos also to Miguel Socolovich, Matthew Bowman, Jonathan Broxton, and Kevin Siegrist. To have any chance at October, those guys had to step up, and they certainly did. Hero: Matt Carpenter. Trailing 2-1 in the sixth, Carpenter smashed a three-run homer that gave the Cardinals a lead and some life, even though they pretty much knew it wasn’t going to matter. For the second straight year, MLB started all games on the last day at roughly the same time, so the Cards knew that the Giants had gotten out to an early 5-0 lead and, given the Dodgers had nothing really to play for, that lead probably wasn’t going away. Still, this team didn’t just pack it up but put together this rally, with Carpenter providing the spark, and then a serious seventh inning to put the game away. Carpenter had just the one hit, but drove in four on the day. Goat: Jonathan Broxton. A day after helping out with that great bullpen game, Broxton scuffled in this one. In his first two batters he allowed a single and a John Jaso homer to tie the game up at 4. He got the next two out and his teammates not only got him off the hook, but got him a win. That doesn’t keep him out of this slot, though. Notes: We talked about all the questions that Adam Wainwright leaves the club pondering this winter, but he added a little more uncertainty by turning in his best start in his last four and one of his better ones in the second half of the season, a second half when he had an ERA of 4.79. Waino went six and allowed just two runs and struck out eight, though he did allow six hits. That seemed to be Waino’s issue a lot this year–he allowed hits by the bushel, even when they didn’t bite him. (Sometimes, though, they took a huge chunk out of him.) I know Wainwright’s going to do a lot of work this offseason and hopefully we’ll see better results next season, though as we have said a lot, his days of being the staff ace are probably over. They gave Matt Holliday one more moment on Sunday, sending him out to left field before the top of the ninth as the rest of the team stayed in the dugout. The only player on the field, Holliday stood in the outfield and listened to the thunderous applause rain down on him before the rest of the team came out, including Tommy Pham to let Holliday make one last trip off the Busch Stadium diamond. As Tara and I talked about on Gateway Sunday night, it’s kinda strange to see such observances take place for a player that isn’t retiring. We’ve seen it over the past few years with David Ortiz and Derek Jeter, who got the grand retirement treatment, and even more locally with players like Mark Teixeria, who I’m sure Yankee fans have been feting as the season wound down. But Matt Holliday will play somewhere in 2017. It’s even possible that he’ll play in St. Louis, though the odds of that are really slim (and we can talk about if that’s a good decision or not at another time). We don’t often get a chance to know that a long-time player is leaving. Even when Albert Pujols left, while there was a lot of “this could be his last at-bat as a Cardinal”, there was no real opportunity to shower with affection because there was no knowledge that he was, in fact, leaving. That didn’t come until the offseason and the Cardinal fans have never had a chance since then to pay their respects. It’s just an interesting phenomenon, one that may have also been going on in Philadelphia with Ryan Howard. I know I saw people marking his last game with the club, though I don’t believe he plans to retire either. It’s good, though–people that have had such a long-term impact on an organization should have that impact recognized, even if it’s not their final time on a baseball diamond. Before we leave this game (and our final wrapup), we should note that Yadier Molina had three more hits in this game, continuing a second-half tear that was truly remarkable. Perhaps we should make sure Molina never again goes to an All-Star Game! There’s lots of things to talk about going forward. The Cardinals aren’t sure they are picking up Jaime Garcia‘s option. Given we didn’t see him at all this weekend, even in a bullpen game, they well may not. The club is making a push for Lourdes Gurriel Jr, a Cuban defector that looks to be an intriguing talent. How would he fit into the picture if, indeed, they were able to land him? We’ll talk about all those things in the future, either here or on one of the many podcasts. I’ve got a few ideas for posts coming up, plus as you know the second annual Top Cards on Twitter voting is going on, so we’ll have that. I’ve got the second half prediction contest graded and will be sharing those results soon. Our annual series of Exit Interviews will be probably hitting the site close to the end of the month. I have another project in the works that a certain segment of you will hopefully enjoy and most of you will skip without reading. I’ve got a pile of books here, both read and unread, that I hope to do some reviews on. Keep following me on Twitter and checking the blog–we don’t take the offseason off around here!